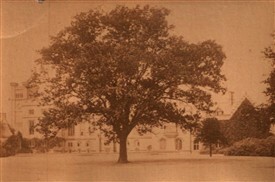 Describing the tree as it appeared in 1850, an anonymously published booklet entitled A Visit to Sherwood Forest (Mansfield: Collinson, 1850, p.33) said "It has now attained a goodly size, considering the slow growth of the oak, and bids fair to become a lasting memento of the noble bard, and to be a shrine to which thousands of pilgrims will resort in future ages to do homage to his mighty genius. "He planted it on his first arrival at Newstead, in 1798, and ever after displayed 'the greatest regard for its prosperity', actuated, it is said, by an impression or fancy, that as the tree flourished so should he; 'As it fares', said he, 'so will fare my fortunes'. 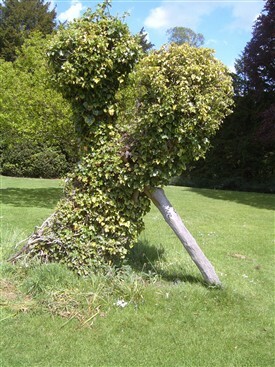 And ivy thy trunk with its mantle entwine,"
Financial pressures ultimately forced Byron to put Newstead up for sale, but it proved difficult to find a buyer. Byron left England in 1816, never to return. In 1818, the estate was purchased for £94,500 by Col. Thomas Wildman, a friend from Byron's school days. Wildman spent a further £100,000 refurbishing the house and gardens. As our picture shows, the oak did obscure the south facade of the Abbey, so one can perhaps understand Col. Wildman's initial reaction. Needless to say, however, the tree was not removed, and in the years after every possible care was accorded the tree. Its remains still survive at Newstead today - although, sadly, it is now little more than a stump.